Lauren Weintraub* (Annie, July 19 - 26, August 4 - 10) is a 14 year old Equity actress, dancer and singer from Sudbury, MA. She is thrilled to be making her Theatre By The Sea debut. She earned her Equity card playing Annie in the summer of 2011 at Maine State Music Theater where she received a BroadwayWorld Boston nomination for Best Actress in a Musical. 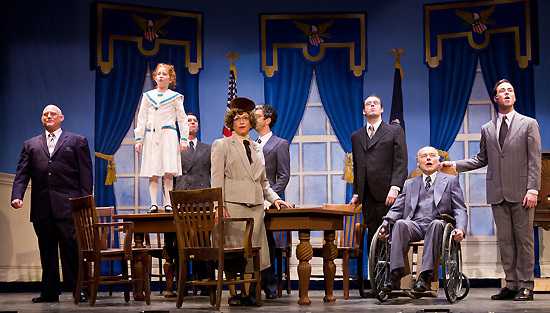 She also played Annie in 2012 at North Shore Music Theatre. This past spring Lauren starred off Broadway in My Mom is Trying to Ruin My Life (Emma) at the Workshop Theatre. Other theater credits include Annie (Molly), The Sound of Music (Gretl), Gypsy (Baby June) and Fiddler on the Roof (Bielke). Lauren can also be heard as the voice of Zoe in the newly released Academy Award nominated animated film A Cat in Paris. She recently sang backup harmonies for Broadway's Jeremy Kushnier in the Rockers on Broadway benefit at The Cutting Room in NYC. She has also had the honor of singing the National Anthem at Gillette Stadium. When Lauren is not on stage, she can be found dancing, playing guitar and piano or hanging out with her friends. Many thanks to both her agent, Nancy Carson, and manager, Jody Prusan, as well as her voice, dance and acting coaches. Amelia Rose Allen* (Annie, July 27 - August 3). Eleven year old Amelia Rose Allen is honored to be making her Theatre by the Sea debut in "Annie" under the direction of Mr. Richard Sabellico. Amelia was last seen in this role at Surflight Theatre in NJ, summer of 2012. Other recent theatre credits include: Susan Walker (Miracle on 34th St. Westchester Broadway Theatre, NY), and Lana Dee (Jackass Flats, Shadowland Theatre, NY). Next month Amelia will play Kyla in a workshop production of a new play "Between Pretty Places" at Here Theatre in NYC, and in the fall will go on as Eleanore in "The New Kid", an educational touring production about anti-bullying appearing at NY/NJ/CT middle-schools. Amelia's voice has been heard on Nickelodeon, and she has appeared on TV's Celebrity Ghost Stories. Amelia is grateful to her family for their unending support, to her manager Kim Pedell and agent Nancy Carson, voice teacher Amelia DeMayo, acting coach and mentor Joyce A. Presutti, and to her dance coach, the amazing Mary Jane Houdina. When Amelia isn't performing she loves playing with her many pets, playing guitar and writing songs, cooking, and playing with her friends. There are no ordinary moments! Raquel Leifer (Annie, July 17 & 18) is a 12-year-old singer, actress, and dancer from New Jersey. Raquel is thrilled to be performing as Annie at Bill Hanney's Theatre By The Sea. Raquel has previously played the role of Annie at the Mount Washington Valley Theatre, and Leonia's Summer Stage Theatre. Most recently Raquel played the role of Jacqueline in the workshop for Ever After- A Cinderella Story: an upcoming Broadway musical. Raquel's hobbies include: reading and playing with Billy her Bijon. Special thanks to Bill Hanney, Richard Sabellico, Arianna Knapp, Patrick Egan, as well as the entire cast and crew for making this a summer to remember!! Thank you to Mom, Dad, Amanda, and Jillian for their support and encouragement. Todd Fenstermaker (Oliver Warbucks) is thrilled to be making his TBTS debut in one of his favorite musicals! Tours: Broadway Asia's The Sound Of Music (Von Trapp), and The King And I (Captain Orton / Edward Ramsay), West Side Story (Schrank, Doc), Damn Yankees (Welch). Regional: Show Boat (Steve), Sweeney Todd (Sweeney), Annie (Warbucks), 1776 (Rutledge), The Drowsy Chaperone (Feldzieg), Man Of La Mancha (Innkeeper). Film: A Dangerous Place. Television: "Late Night with Conan O'Brien," "The Late Show with David Letterman," "The Real Housewives of New Jersey." Love and thanks to my family and to Debbie for their constant support! Tom Roberts (F.D.R., Asst Dog Catcher) returns to Matunuck where he made his stage debut 50 years ago in a play starring Alan Alda and Dorothy Lamour. After that brief dose of glamour, he returned to school where he acted regularly. Since 1981 he has been a company member of 2nd Story Theatre, appearing in dozens of productions, including August: Osage County, The Little Foxes, A Flea in Her Ear, Midsummer Night's Dream, The Front Page, and Auntie Mame. Tom is a history professor at RISD, author of eight books, and a writer/producer of historical documentaries, one of which was nominated for an Oscar. Nathaniel Shaw* (Rooster Hannigan, Assistant Director, Co-Choreographer, Dance Captain) is thrilled to be making his Theatre By The Sea debut. Nathaniel is the Founding Artistic Director of The Active Theater. For Active he directed the first New York City revival of Richard Greenberg's The Violet Hour (IT Award Nomination, Best Revival), and World Premieres of Body Language and Bridgeboy. Regional directing and choreography credits include Hair (13 New Hampshire Theatre Award Nominations), Hairspray (7 NHTA Nominations), Damn Yankees, A Chorus Line, and Spelling Bee. He will be choreographing Pippin at Phoenix Theatre in the Spring. Performing credits include The Paul Taylor Dance Company, Curly, Riff, Joe Hardy, Zach, Ren, Jerry Lukowski, Younger Brother, the Emcee and Lt. Cable. Love to my wonderful wife Lisa. Macy (Sandy) was adopted from Rocky Spot Rescue of Oklahoma City, OK in December of 2009 by guardian and trainer Bill Berloni at the age of 18 months. Her first production of Annie was in the summer of 2010 and since she has starred in over a dozen productions nationally. On Thanksgiving Day 2011, she was seen on NBC during "The National Dog Show," sharing spots with John O'Hurley. Taylor Rose Donovan (Tessie) is a sweet and funny 10 year old from Stonington who will start 5th grade in the fall. She is so excited to be playing the role of Tessie and has made some great friends this summer! Her past theater experiences include: Stonington High School's The Sound of Music (Marta), ELRT's The Wiz (Munchkin/Ozian), and Missoula Children's Theatre Snow White and the Seven Dwarfs (Tambourine the Dwarf). She studies dance at Kathleen Messina's Danceworks and loves the stage. She would like to thank her family and voice teacher, Erin Stanley, for encouraging her to follow her dream! Lilly McMahon (Kate) is a 10 year old from Warwick, RI, who attends St. Rose of Lima School. She is thrilled to return to TBTS after playing the role of Marta in The Sound of Music in 2012. She has also enjoyed other roles including Ugly in Honk Jr. and Alice in Alice in Wonderland Jr. with Manhattan Music Man Productions. Lily has also performed in several productions with Rhode Island Youth Theater, including Annie Jr. and The Sound of Music. In addition to performing, Lily enjoys playing softball and spending time with her large family. Jennifer Pamula (Duffy), a 12-year-old performer from Exeter, RI, is honored to take part in this great RI tradition at TBTS. An ambassador and honor roll recipient at Bayview Academy, she played (Annie) Annie, at 10, with Director Christine Kavanagh and found her place on the stage. She appeared in Academy Players Annie (Annie); Bayview: Cabaret (Shirley Temple), (Kate), Wizard of Oz (Winkie General, Munchin). When off stage, Jenny is playing guitar, writing music, plays, and putting on shows with her friends. Thanks to TBTS, cast and crew, her teachers, family and friends for their support. Enjoy the show! Nina A. Pezzello (Pepper, u/s Annie). Nina is an 11 yr old performer from Waterford, Connecticut. Her passions are dancing, singing, acting, and piano. She is an "A" student and her favorite subjects are reading, writing and of course, music! She has been performing on stage since the age of 3 with her dance company KIKS Dance Center, and most recently took home Platinum and High Gold awards performing with her competitive dance team. Her theater experience includes playing a Munchkin and Ozian in The Wiz at East Lyme Regional Theater, Young Cosette in Les Miserables at Waterford High School, a Munchkin and Winkie in The Broadway National Tour of The Wizard of Oz, and four roles in Albano's Professional Nutcracker. Nina is thankful for all of the support from her family and friends and is absolutely thrilled to be a part of Annie at TBTS! Her dream is to be on Broadway. Emma Senerchia (July) is thrilled to be onstage at TBTS! She is 11 years old and attends St. Rose of Lima school in Warwick. She has performed in many school plays and RI Youth Theatre shows including: Annie (Annie), AristoCats (Thomas O'Malley), and Seussical (Wickersham). She has been dancing for 8 years at Let's Dance Studio and is on the competitive dance team. She also enjoys playing guitar. Special thanks to Mom, Dad, twin sister Ella, little sister Eva, and friends and family! Eva Senerchia (Molly) is thrilled to be back onstage at TBTS! She is 10 years old and attends St. Rose of Lima school. She appeared in The Sound of Music (Gretl) last summer. She performed in Trinity Rep's A Christmas Carol (Belinda Cratchit) and RI Youth Theatre shows Annie (Molly), Seussical (Jojo), and AristoCats (Marie). Favorite school shows include The Little Mermaid (Sebastian) and Snow White (Happy). She's been dancing for 7 years at Let's Dance studio and is on the competitive dance team. Lots of love to Mom, Dad, sisters Ella & Emma, and family and friends! Schuyler Beeman* (Apple Seller, Howe, Ensemble, Dog Handler) is thrilled to be joining this production of Annie with Macy! Regional: Ivoryton Playhouse, CT - The Producers (Carmen Ghia), Finian's Rainbow (Woody u/s/Choreographer), Cabaret (Bobby/Boy Soprano); Westchester Sandbox, NY - ...Spelling Bee (Chip); Middlebury College, VT - The Wild Party (Lippa's) (Burrs), Gypsy (Tulsa), Sweeney Todd (Pirelli). Schuyler has also traveled the North-East choreographing many shows including a full season with the College Light Opera Company. Many thanks to everyone at TBTS as well as Bill and Dorothy Berloni for bringing me back to the stage. Joshua Christensen (Bundles, Eddie, Fred McCracken, Ickes, Judge Brandeis, Ensemble) is a recent graduate of the University of Rhode Island where he received a B.F.A in Theater. Some of his favorite credits include Rent, The King and I (Ocean State Theater Company); Singin' In the Rain, The Seagull, Marat/Sade, The Taming of The Shrew, The Rocky Horror Show (URI Theater); Master Class (2nd Story Theater); Antigone (La Voce); and Joseph and the Amazing Technicolor Dreamcoat (RI Stage Ensemble). Michelle Geosits (Connie Boylan, Ensemble, u/s Anette/Cecile/Mrs. White), a rising junior at The Boston Conservatory, is thrilled to be spending her summer as an acting intern at Theatre By the Sea! Michelle was most recently seen in Clubland:The Monster Pop Party at the American Repertory Theatre's Club Oberon as the role of Gitsie. Michelle also recently performed as Joanne in The Boston Conservatory's production in Elegies for Angels, Punks and Raging Queens. Love and thanks to family and friends! Michael John Lewis (Bert Healy, Morganthau, Ensemble, u/s Rooster) is thrilled to be making his debut at Theatre By The Sea. Other regional appearances include The St. Louis MUNY, Pittsburgh CLO, The State Theatre of Pennsylvania, and Courthouse Center for the Arts. Originally from Pittsburgh, Michael holds a BFA in Musical Theatre from Penn State University. Many thanks to Richard and the entire staff here at TBTS for this wonderful opportunity. This performance is dedicated to his late father, Frank. "This one's for you Dad!" Greg London (Dog Catcher, Drake, Ensemble, u/s Warbucks/F.D.R./Bert Healy). National tours: West Side Story (Doc), Hairspray (Edna Turnblad), Fiddler on the Roof (Lazar), A Streetcar Named Desire (Mitch). International tours: Hairspray, The Fantastics. Off-Broadway: Spurn. Regional: Richard III (Richard), Macbeth (Macbeth), Greater Tuna (Thurston), Assassins (Czolgosz), Annie (Warbucks). Last seen at TBTS in The Sound of Music (Admiral Von Schreiber). Greg was the 2006 recipient of the Eugene O'Neill Award for Dramatic Writing. Dennis Keohane (Lt. Ward, Hull, Ensemble) is a Rhode Island Native who is excited to be returning to TBTS, having last appeared in Anything Goes. Favorite roles include West Side Story (Tony), You're A Good Man, Charlie Brown (Snoopy), and The Who's Tommy (Captain Walker). Dennis also had the privilege of performing as a featured soloist in John Bucchino and Friends in Concert at the Calderwood Auditorium in Boston. He sends his love to his family and friends. Birdie Newman Katz (Mrs. Pugh, Perkins, Ensemble, u/s Miss Hannigan). Yente in North American Tour of Fiddler on the Roof. 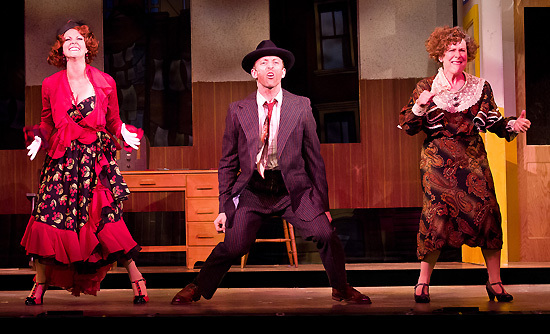 Regional Theatres: Maine State Music Theatre, Engeman, Beef and Boards, Show Palace. Favorite role: Peter Pan. TV/Film: HBO's "Empire Falls" - Kissed Paul Newman! ; "At Home With the Singing Chef"; National Anthems - Red Sox, Celtics; Bullets, Orioles. Concert singer, pianist, and great cook! Married to Maine State Senator Roger Katz, mother to Jonathan, Shari, Noodle, and Pupcorn. Love to Mom, Adam and Molly! Thanks, Richard!! Arnie Rodriguez (Chauffeur, Jimmy Johnson, Marine Honor Guard, Ensemble) is honored to be with Theatre By The Sea this summer. He is currently pursuing a BFA in musical theatre at The Boston Conservatory. Favorite credits include: CLUBLAND: The Monster Pop Party at A.R.T's Club Oberon and West Side Story. Many thanks to his beautiful support team: Mom, Dad, Veronica, Blake, Yael, Andrew, and a special thanks to Kevin P. Hill for this amazing opportunity! Joshua Charles Skurnik (Sound Effects Man, Ensemble, u/s Drake) is beyond excited to be making his Theatre By The Sea debut this summer! Josh is a rising senior at The Boston Conservatory. Some Conservatory credits include: Grey Gardens, The Apple Tree, Zombie Prom, and Elegies. Other theaters include: Reagle Music Theatre, and Paper Mill Playhouse. Josh can also be seen in La Cage Aux Folles at both Theatre By The Sea and North Shore Music Theatre. He would like to thank Kevin and Arianna for this incredible opportunity. Love to my family, jags, cast/crew and the creative team for all of their endless support. Victoria Weinberg (Sophie, the Kettle, Cecile, Bonnie Boylan, Ensemble, u/s Grace/Star to Be) is thrilled to be at Theatre By The Sea! An NYU graduate, she is the artistic director of the Libra Theater Company, now in it's 3rd year. Favorite roles include Baker's Wife (Into the Woods), Maria (Twelfth Night), Stepsister (Cinderella), and Cheshire Cat (Alice in Wonderland). She has sung with composers such as Mark T. Evans, Carner & Gregor & Joshua H. Cohen. Film/TV: Mania Days (opposite Katie Holmes), True Work (Soho Film Fest) and the lead in "Celebrity Ghost Stories." Love to Richard, my family, Bobby & Tobi. Ellen Laura White (Mrs. Greer, Ronnie Boylan, Ensemble, u/s Mrs. Pugh/Perkins/Sophie) is thrilled to be joining the talented cast of Annie this summer! Born and raised in Houston, Texas, some of her most recent credits include The Crucible (Susanna Walcott), Blueberry Fields Some of the Time (Ringo Starr), Dream Babies: The Musical (Swing) , As You Like It(Amiens), Ravioli the Opera (Ariel), Story Park (Sasha), Central Park: The Musical (Janet), Measure for Measure (Mistress Overdone) and the title role in Yerma. Graduate of Circle in the Square Theatre School. Brigid Fitzgerald (Ensemble, u/s Annie (went on July 18)/Pepper/Duffy/July) is thrilled to be returning to Theatre By The Sea. She was last seen in the 2011 Children's Festival production of Twinderella. A South Kingstown 5th grader, she has appeared in over 15 musicals. Brigid's favorite role was Virginia in Yes, Virginia. She would like to thank her family and TBTS for this incredible opportunity.